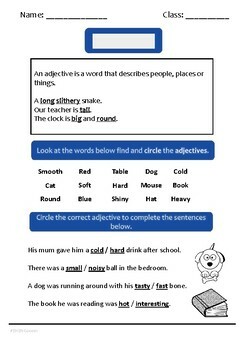 Adjectives worksheet by a British teacher for new to English learners. An adjective is a word that describes people, places or things. The worksheet has two parts. Part 1 - Learners have to look at a range of words and identify which ones are adjectives. Part 2 - Learners have to circle the correct adjective to complete the sentence.